Visionary activist and author Jeremy Rifkin exposes the real stakes of the new economy, delivering "the clearest summation yet of how the Internet is really changing our lives" (The Seattle Times). Imagine waking up one day to find that virtually every activity you engage in outside your immediate family has become a "paid-for" experience. It's all part of a fundamental change taking place in the nature of business, contends Jeremy Rifkin. After several hundred years as the dominant organizing paradigm of civilization, the traditional market system is beginning to deconstruct. 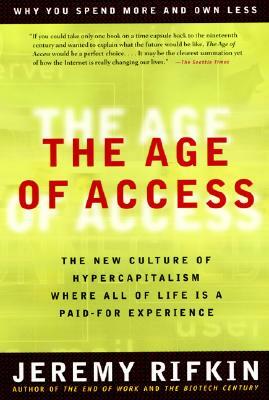 On the horizon looms the Age of Access, an era radically different from any we have known.